Here's your weekly walk through the Phillies minor leagues. This time we glance at some noteworthy performances from the four full season clubs as well as the Venezuelan Summer League. Venezuelan Summer League team….9-3 record, 1st place tie in the 4 team league. Catcher Rafael Fernandez has been scorching hot for the VSL Phils in the early going. Through his first 7 games, the 20-year-old posted a .458 batting average with a double and a homer while driving in 7 runs. The righty batting native of Caracas, VZ is in his 3rd season in the VSL and tallied a .220 batting average with 1 HR in 65 games over his 2 previous seasons. Through 3 starts, Douglas Parada has a 2-0 record with a 2.00 ERA while striking out 14 batters and walking only 1 in 18 innings pitched. Additionally, Parada has held opponents to a .161 batting average. The 19-year-old left-hander was signed last July and made 5 starts in the VSL last summer, posting a 0-2 record with a 5.40 ERA in his debut campaign as a pro. In Friday’s contest against the Tigers’ club, Wilmer Oberto was a single shy of hitting for the cycle. Oberto, 19, is a lefty hitting outfielder that has posted a .326 average with 6 doubles, a triple and a homerun while driving in 6 runs through his first 11 games this season. Lakewood BlueClaws….19-29, 6th place, out of 7 teams, in the Class A South Atlantic League’s Northern division. Kelly Dugan (pictured, left) has been performing very well since coming off the disabled list after suffering an ankle sprain. The 21-year-old first baseman posted a .295/.385/.545 line in 12 May games. Dugan, a 2nd round draft selection in 2009, was an All-Star in the short-season NY-Penn League with Williamsport last season. There really isn’t much hotness going on in Lakewood these days. The team’s lineup on Friday ended the game with four batters hitting under .190, while just two batters, Dugan and first baseman/third baseman Harold Martinez, had batting averages above .250. Additionally, the BlueClaws’ starting rotation entered play on Saturday with two hurlers who had ERA’s at 6.00 or greater as well as three individuals with no wins. Clearwater Threshers….25-22, 2nd place (6 GB) in the Class A Advanced Florida State League’s North division. Lefty hurler Jesse Biddle has been excellent in 5 May starts. The 20-year-old has a 2-0 record with a 1.38 ERA and a .191 batting average against this month. Biddle was the Phils’ first round pick in the 2010 draft. Brody Colvin, who was struggling this season as a starter, was used in relief on Saturday, for the first time this season. Colvin, who entered action with a 5.64 ERA through 9 starts, allowed 1 earned run in 2 innings of work against the Daytona Cubs. The 7th round draft pick from 2009 was among a group of hurlers nicknamed the "Baby Aces" last season, but has continued to have a rough go of things in Clearwater, while his teammates have moved on and upward in the system. Reading Phillies….27-20, 2nd place (1/2 GB) in the Double-A Eastern League’s Eastern division. Outfielder Leandro Castro recently had an 8-game hitting streak in which he went 16-for-32 (.500 avg) with 5 doubles, a triple and 2 HR. Castro’s .309/.356/.519 line through his first 22 games in May dwarfed his .214/.240/.329 output in 20 April games. Castro, 22, has played all three outfield positions as a pro. Overall, the Dominican born righty hitter is batting .260 with 3 homers and 22 RBI this season. Shortstop Troy Hanzawa has posted surprisingly strong numbers this season. The Hawaiian born right-handed hitter sports a .308 average with 5 doubles, 2 triples and 18 RBI through 41 games this season. Hanzawa, 26, hit .213 in 120 games with Clearwater and Reading last season. Also, the Phillies' 16th round draft pick from 2008 was a .246 hitter in 4 pro seasons in the minors prior to 2012. Reading closer Justin Friend (pictured, right) has been exceptional out of the bullpen this season. The 25-year-old right-hander has posted a 0.53 ERA with 10 saves and no decisions in 16 games thus far in 2012. Friend, an Oklahoma State product, was a Rule 5 draft pick in 2010 out of the Oakland organization. Phillies top ranked offensive prospect Sebastian Valle has had a rough month. Through game action on Friday, the Mexican born catcher was sporting a .167/.187/.292 line in 18 May games. 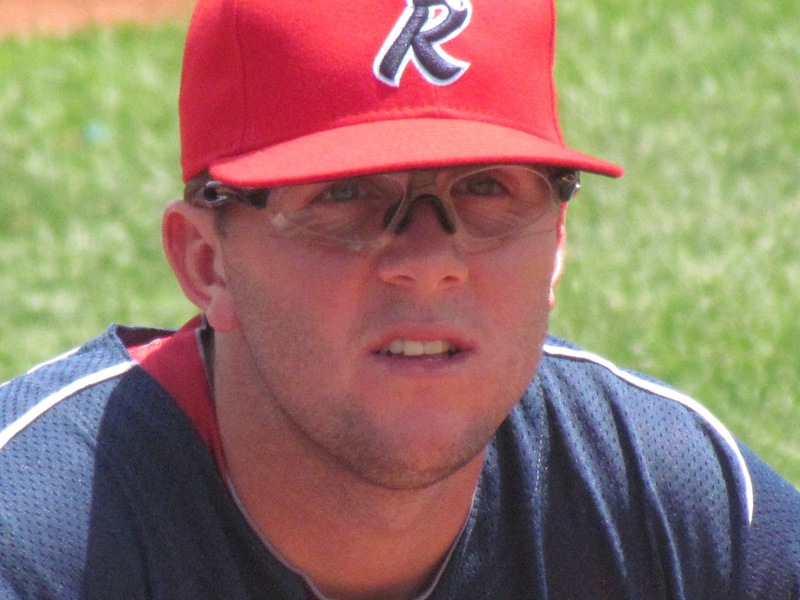 Valle, 21, bounced back a bit on Saturday, lacing 2 hits including a homer in Reading's loss at Harrisburg. Valle is batting .229 with 6 doubles, 4 homers and 16 RBI in 36 games thus far in 2012. Lehigh Valley IronPigs…28-21, 2nd place tie (2.5 GB) in the Triple-A International League’s North division. Veteran hurler Dave Bush has thrown back-to-back scoreless outings in his last two games, including a complete game shutout against the Louisville Bats last Tuesday, in which he struck out 6 batters and walked none. Overall this season, the right-hander has a 4-3 record with a 2.73 ERA. The 32-year-old was signed as a free agent, by the Phillies, last August. Michael Schwimer has posted extremely good numbers with the IronPigs this season. Overall in 13 games with Lehigh Valley, the 6-foot-8-inch 240-pounder has a 2-0 record with 5 saves and a 1.08 ERA. He also has averaged 9.72 K’s per 9 innings. Comparatively, at the big league level, Schwimer produced an 8.53 ERA in 5 appearances this season. Domonic Brown has been playing some center field lately for the IronPigs. The 24-year-old prospect is sporting a .172 batting average in 9 May games. Brown is still without a homerun on the season through 31 games overall.